Design your own unique Shimansky creation and enjoy the free shipping we offer to any State in the USA. Whether it’s a diamond engagement ring, a pair of timeless diamond stud earrings, a diamond bracelet or a diamond pendant, , wearing a custom diamond jewelry creation from Shimansky is a extraordinary way to express your unique love and personal style. Shimansky’s international acclaim lies in our extraordinary art of design, technical precision and design excellence which we apply to meticulously balance form and function. The result? One of a kind custom engagement rings and other jewelry masterpieces that are unique, beautiful, and timeless to be cherished for a lifetime. Shimansky’s team of expert jewelry designers, diamond setters and master goldsmiths ensure that your personalised jewelry creation is brought to life with the utmost care and attention to detail while using the finest precious materials. A combination of artistry and our state-of-the-art 3D CAD technology allows for Shimansky custom made engagement rings and other jewelry creations to be crafted for maximum beauty. Creating the perfect custom jewelry item is an emotionally rewarding experience, one that Shimansky would be delighted to guide you on. We passionately offer a unique design experience that will help you bring your dream statement piece to life. The My Girl diamond is the world’s first square-cut diamond with a diamond-shaped table, exclusive to Shimansky. The signature diamond cut delivers the perfect balance of fire, brilliance and scintillation, reflecting light with every move you make. 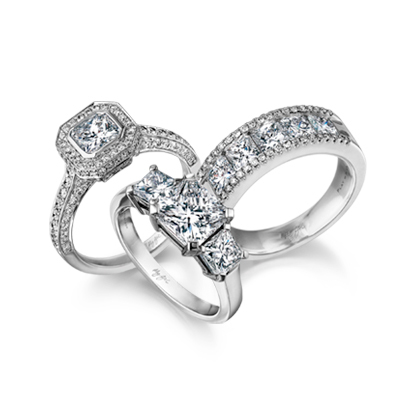 Because of their unique cut and unrivalled beauty, My Girl custom diamond rings are a popular choice for engagements.